Hull: Finer bow, straighter rocker, flatter bottom, squarer chines and lower freeboard all combine to produce a hull with less weight and windage for optimum lo-riding performance. Volume has been kept in the stern for a cleaner lift-off. The reduced size and volume of the hull has big cost benefits when transporting the Bladerider. Hydrofoils: High-lift T-foils on centerboard and rudder, purpose-designed for lowest drag and maximum lift in speed range 6-24 knots. Flaps on the main foil are controlled by the bow wand mechanism, geared for easy lift-off. The entire rudder assembly can be rotated by the tiller twist grip to manually adjust the angle of of attack. The downward curve in the center of the foil gives greater lift, and the upward curve in the tips reduces tip vortex. 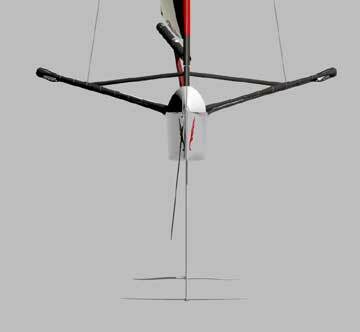 Lift Controls: Automated lift control on centerboard hydrofoil flap mechanically actuated by bow wand; manual lift control on rudder hydrofoil by tiller twist grip. Rig and Fittings: 100% carbon boom and mast, Ronstan fittings and Marlow ropes. 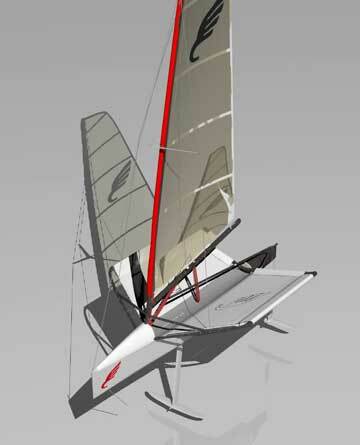 Construction: Pre-preg carbon hull, aerodynamic molded carbon wing frame, pre-preg carbon centreboard, rudder and foils, carbon fibre mast and boom, carbon tiller, pre-preg carbon molded low-drag rudder box, dacron trampolines. Weight: under 10kg hull only, painted or 30kg fully rigged. 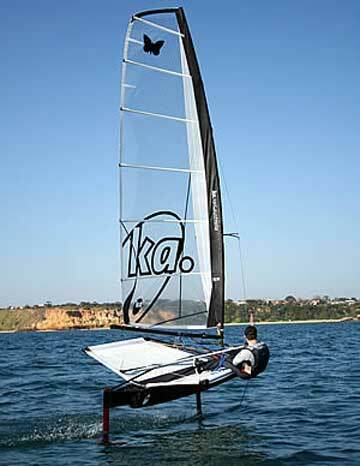 Sail: Comes with a standard International Moth 8m KA sail.